I bought this little side table a long time ago at TJ Maxx. Up close, it's a mosaic tile of broken china plates. I love it and it's moved around from room to room...but in different colors. 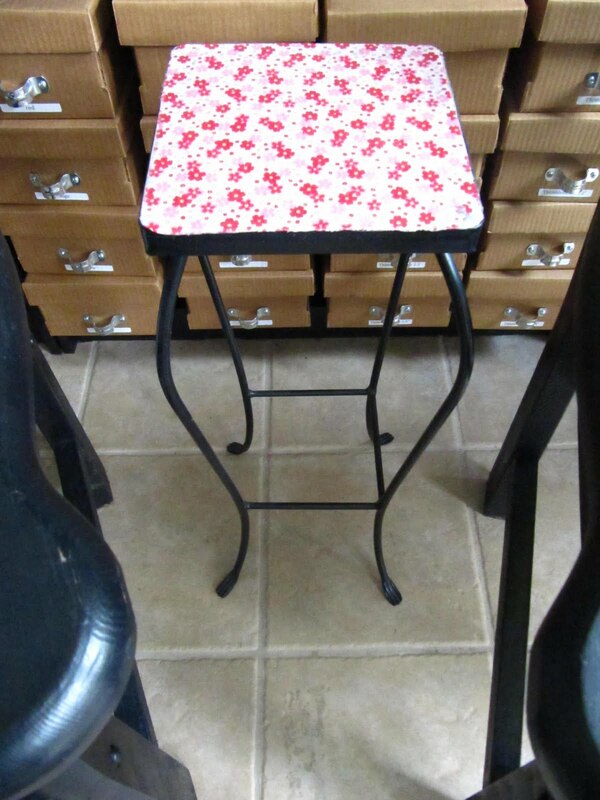 This is when it was pink and red to match the fabric in Courtney's room. 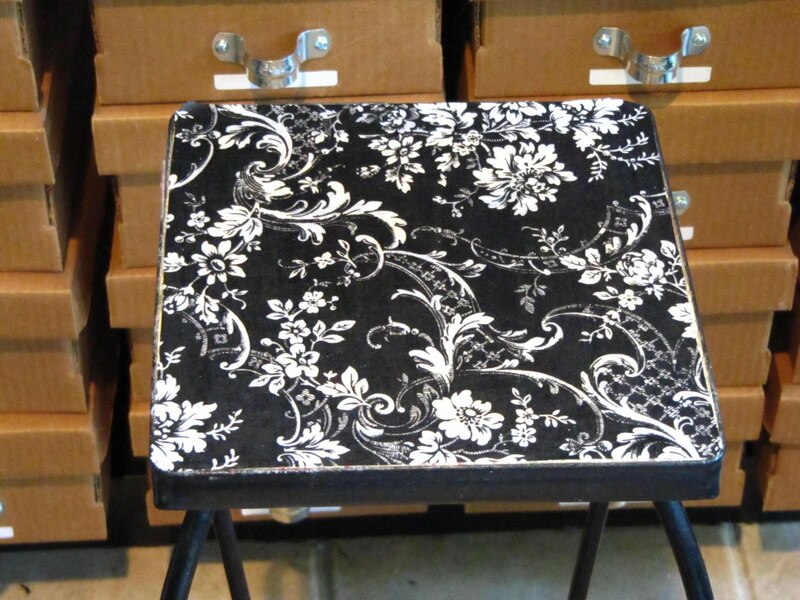 This is the black and white version from my sewing room. Now that I've added a little red to my sewing room, it's time for another Mod Podge make over! 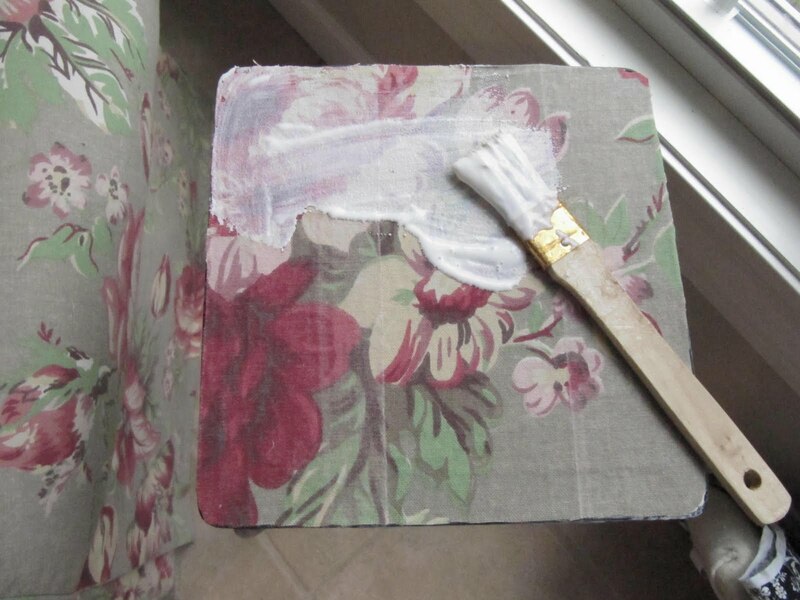 add your fabric to the wet glue and then add another coat of Mod Podge. The top coat acts as a sealer. Now I'm all set for a cup of tea and a little hand sewing or maybe just reading my new catalog from Hancock's of Paducah. I have a gift certificate I have to use too. How nice to have a piece of furniture that can accommodate many needs. Thanks for the info. I just might have need of that one day. looks like I need to get a little table too. Yours looks great. Cute idea. That table is certainly getting a good run. I love your blog... surprises in every post!!! I remember using Modge Podge all the time when I was in high school. I think I need to get myself a new bottle! Thanks for the reminder...I love your 'new' table. Thanks for another great tip Karen! You are so clever with your ideas. Things that never even occur to me! I enjoy seeing what you are up to. I have that same table Karen - what a great idea to make it more useful! Thanks! Don't you just love Modge Podge?! 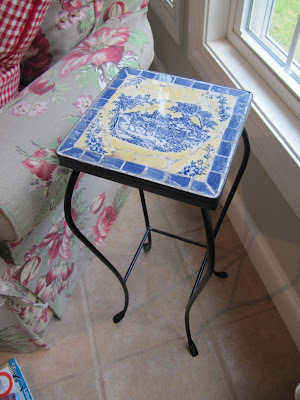 OMG, I have a little table I could do like that....it was planned for a ceramic top. I forgot all about it. Ok, you just gave me some nice ideas, thanks. Very cool. 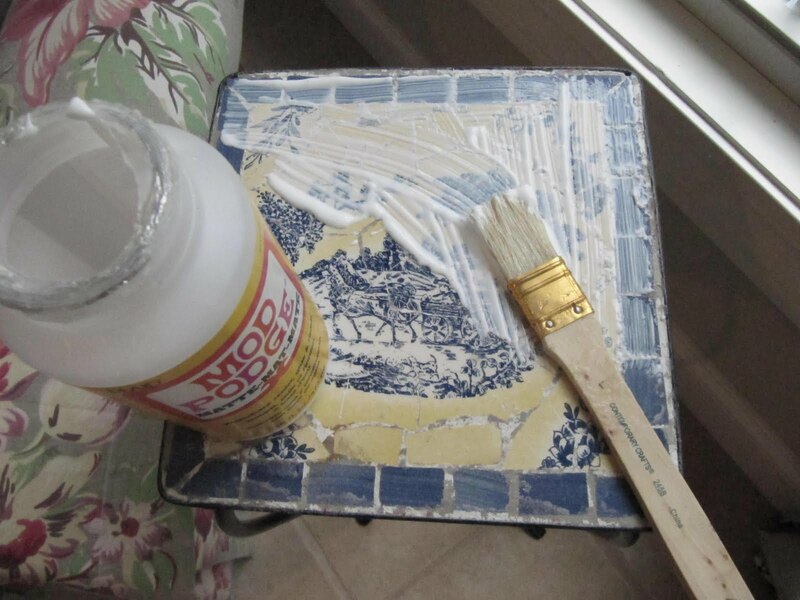 Great idea for modge podge! 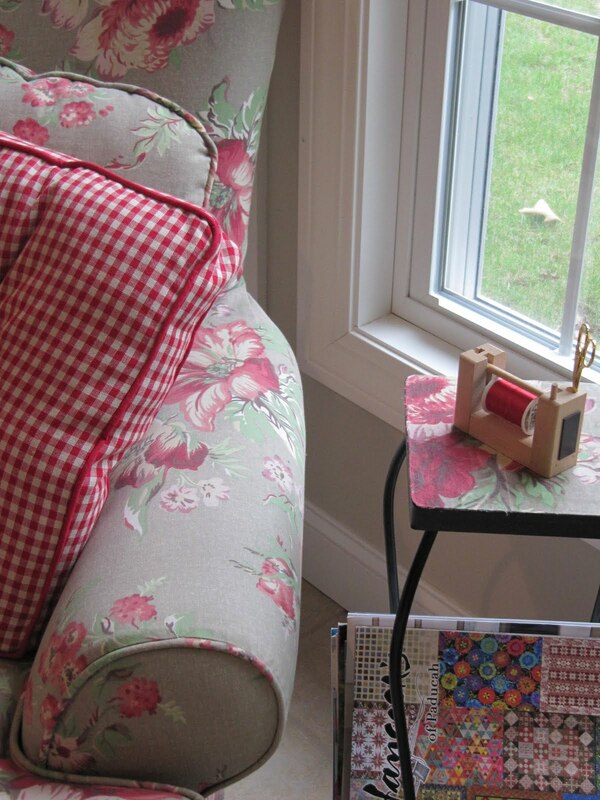 What a lovely little sewing corner you have...and great idea for the table. Great idea. I have one I can do that to also. 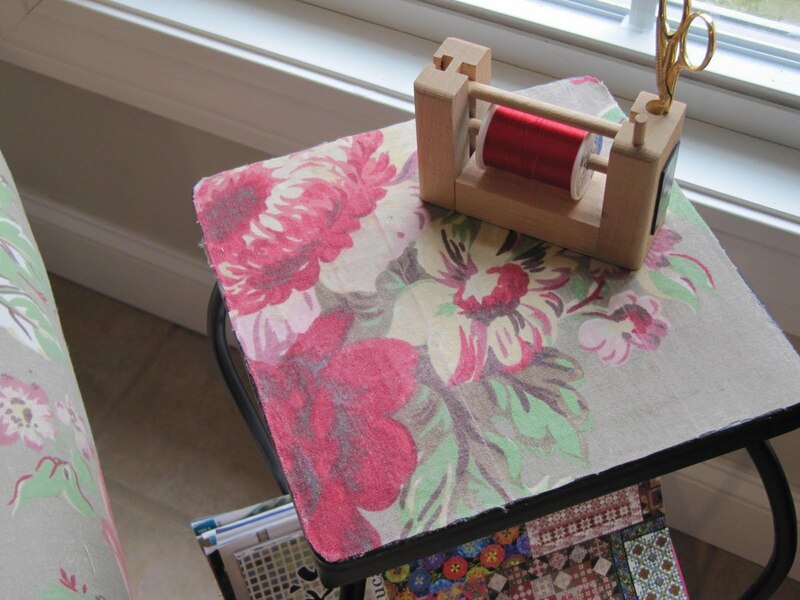 Love your little thread holder for the end table. Was reading back on some of your blogs, and think I need to also make some donuts - this is the easy way!!!!!!!!!!!! Looks so good. You always have great ideas Karen! Very smart of you! Very useful table! Where did you get that fabulous wee thread holder? I often take my snips and thread and needle down in frnot of the tv if I'm going to do a chunk of hand sewing, this would be great! How clever! I would have never thought of that. What a great idea. And so easy to do. I'm thinking of all sorts of possibilities! Oh Karen you have no idea how much I miss TK Maxx! It's big in England too you see, but there isn't a single outlet I know of in Australia... when I first moved out here I used to dream that it was here and be really disapointed when I woke up! LOL!!! 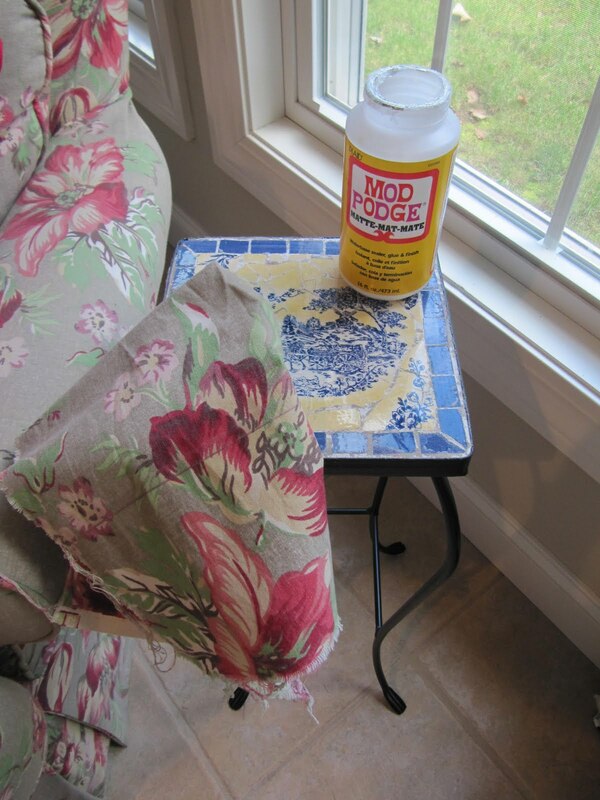 Great idea for the table sweetie - got to love that Modge Podge!! !